Sheer Hubris Press, 9780991186952, 342pp. Sometimes the only way to find home is to leave it. Dori Bardwell's father was the white Southern author of THE novel about slavery, a man who settled his large family up north in a replica of a plantation house and never spoke of his past. A tragic accident pulled Dori from college to care for her only remaining brother, but now the money is running out, her ex-boyfriend appears intent on revenge, a media baron has designs on her father's last, unfinished manuscript, and her own thoughtless blackface joke is about to go viral and turn her life upside down. 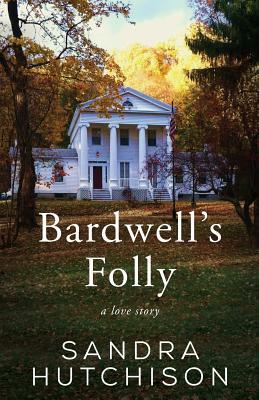 If you like humorous, heartfelt book club fiction with a strong romantic thread, a love of literature, and a sharp eye for race and class in America, you'll love BARDWELL'S FOLLY. Born and raised in the Tampa Bay area, Sandra Hutchison survived a transplant to a small, snowy New England town during high school and eventually stopped sulking about it, though it's possible she's still working it out in her fiction, which includes the novels THE AWFUL MESS: A LOVE STORY and THE RIBS AND THIGH BONES OF DESIRE. She currently lives in Troy, New York, where she teaches writing at Hudson Valley Community College.